I had my dad over today for lunch, part of his fathers day gift. He came in the house carrying this plastic bag, all exited to show us. At first glance, it would seem he was appealing to our collective sweet tooth with some pretty big malted eggs…maybe from Malley’s, but why in that plastic bag? Oh no, they are Quail eggs! And he really thinks I should feed them to the kids because they are so little and cute. It was one of those moments that I just couldn’t tell if he was joking or not. Quail eggs?? I guess my mom works with a lady who raises these birds. Somehow everyone she works with has tried these eggs, so mom thinks they would be awesome to fry up for my 4 year old-who could resist such a cute tiny egg? Well…….. I could. I really could resist those eggs. I let Sammy hold the bag and peer into it. Why are they brown?? Mom, is that poop on those eggs? Really, is he really going to eat these things? I’m kind of grossed out, they look like reptile eggs, and I don’t know if I trust them not to spreading some weird quail disease to my family. I pretty much decided to get rid of them, only feeling slightly guilty. Then mom calls, “please don’t throw those away, they are perfectly good eggs!” She wants me to bring them back to her and SHE’LL eat them if the kids won’t. Because she doesn’t want to waste them. I googled it. Yep, people DO eat these eggs… a lot! Ugh. And then the 17 year old comes home and sees the eggs. Immediately, it is decided we must cook the eggs. 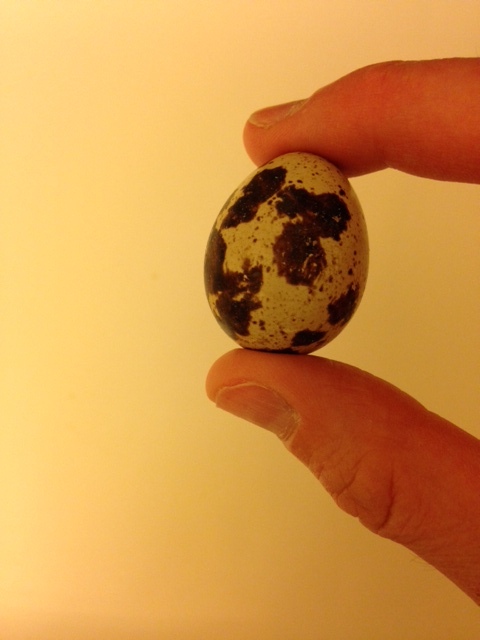 Did you know a Quail egg is harder to crack than a chicken egg? I ruined a few by crumbling the outer shell into the bowl while the inner lining was still intact, making it feel like I was holding this little squishy eyeball in my hand. Yech! Egg parts were all mixed up with shell, so I tossed the bowl and started again. Ok, let’s try frying them. Still felt like I was going to be dropping little baby alligators into the pan. Finally got a few fried, minus one that literally SHOT across the kitchen as I punctured that tough inner lining with a knife. We all shuddered. Once fried, the gross factor was much less. They did look just like normal tiny eggs. They smelled normal. Who to try the first one?? Baby Jenna… that’s who. Because she’s eating again and she will eat anything again, God love her. She walked up and opens wide, and in goes the first bite. Hopefully not along with some crazy bird disease. She likes it, opens for more. Sammy then gets brave, we let him try it. Now we’re 2 for 2. I make the 17 year old try it, mostly because I don’t want the babies to be the only ones at risk for side effects at this point. they are still all standing, assuring me they taste fine. So I try a tiny taste. It DID taste fine, just like a chicken egg. But KNOWING it wasn’t a chicken egg still made my tummy feel gross after swallowing, and I just couldn’t taste anymore. 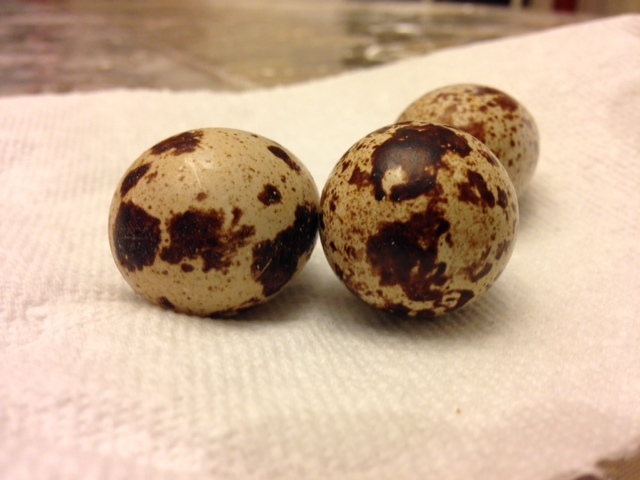 By the way, quail eggs are considered a delicacy in some parts of the world. And I’ve read they are way more nutritious than chicken eggs. I don’t care. They look weird and seem dirty somehow to me. Thank goodness the kids are braver than I am, and seem to be doing ok several hours after their snack. I’m not surprised they ate them. Although I struggle these days to get Sammy to eat a full meal, he and his little sister do enjoy a variety of “weird foods”. 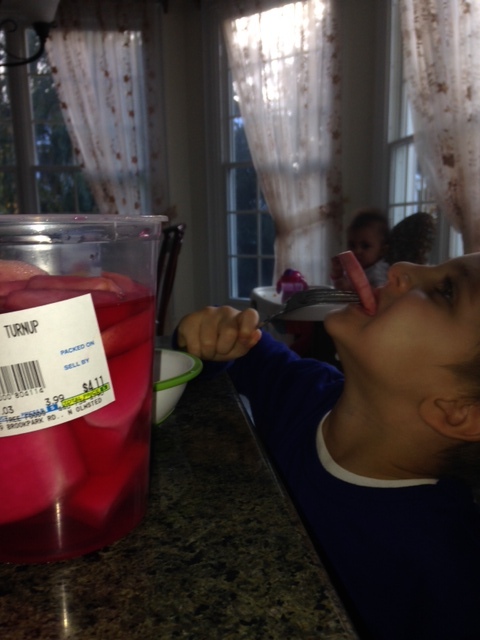 Things I didn’t know existed at their ages… Like pickled turnips, for breakfast. Pomegranate seeds. Eggplant stew. I think it’s great, a little strange sometimes, but great. I buy things just to see if someone might eat it. All kids except one LOVE brussel sprouts. My oldest was eating clams and muscles out of the shell by age 4. Another thing I would not TOUCH, just because they are really really ugly. But great for her! Isn’t it funny how we get comfortable with our “normal” foods, and weirded out by things we aren’t used to? I know someone who had to go to Switzerland on business, and went to a restaurant for dinner…ordered a steak. “Steak de Cheval”…thinking it was some fancy way of cooking it. It was horse. He ate horse steak. Still hasn’t gotten over it. Well, at least I can tell my mom we didn’t waste the eggs. Most of them. I just wish I didn’t feel kind of guilty still, kind of sick to my stomach still….. and I’ll be watching the kids for a while for symptoms. Can’t help it. This entry was posted in Uncategorized and tagged chicken egg, dinner ideas, feeding kids, gross foods, quail eggs, strange foods. Bookmark the permalink.